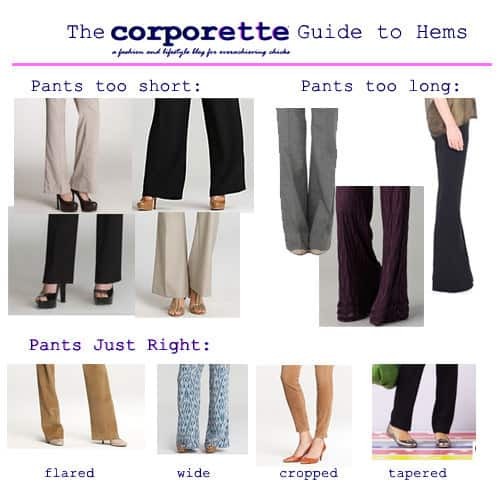 This shopping guide for comfortable heels for work is inspired by one of our all-time top posts, The Quest for Comfortable Heels. We update the text of this page regularly and invite you to add your on-topic comments as well. Last updated: Feb. 2019. Looking for an easier to read PDF of this? Get it here. Forget the Holy Grail — the quest for comfortable heels can be a lifelong hunt for some women. In general, if you can find one pair of shoes you like, try other shoes from that brand (although there can be variances within that brand as well). Note that for interviewing, you should be able to walk a few blocks in your heels comfortably; I would say the same for your first day on the job as well as any big meetings (since you may walk to lunch at a local restaurant). Of course, flats are acceptable for interviewing and beyond, as well! The most comfortable heel brands can be broken down into four price ranges, and then into two categories: The first group holds the stylish/trendy brands that everyone swears by for comfort (whether or not they’re marketed as “comfort shoes”), and the second group of shoes are marketed for comfort but often a bit funky/clunky when paired with, say, a pencil skirt. For specific shoe recommendations other than those pictured below (both from Kat and the readers) check out our 2019 roundup of Top Ten Comfortable Heel Brands (image at right), as well as our regular Hunt feature (in which we hunt for one wardrobe basic or basic accessory in a range of prices) and our afternoon Coffee Break posts (which often feature shoes); you may also want to check out our post on upgrading your shoe collection. Special mention for comfortable (but pricey) professional flats: Chanel. Designed for comfort, but may be funky or clunky, depending on your taste: Arche, Beautifeel, Earthies, Eileen Fisher, FLY London, Gentle Souls (by Kenneth Cole), John Fluevog, Pikolinos, Taryn Rose, Think! 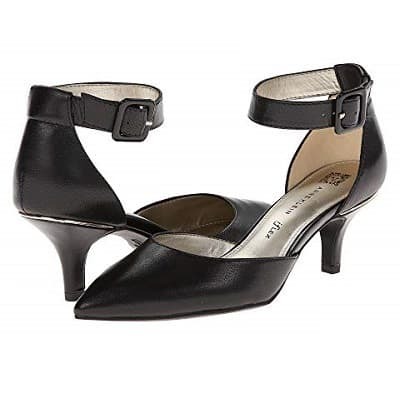 Budget-friendly heels (often under $100): Anne Klein (particularly the iFlex line), Bella Vita, Comfort Plus by Predictions (at Payless, now also at Amazon), Corso Como (readers love this $98 pump), Fitzwell, Soft Style (by Hush Puppies), Sole Society, and Trotters. Read our other tips on great shoe bargains, below. 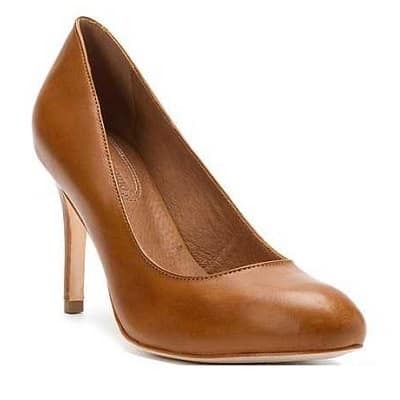 In our last poll on comfortable heels, readers mentioned other favorites including Alfani Step n’ Flex, Brooks Brothers, Butter, Calvin Klein, Coach, Enzo Angiolini, J.Crew, Joan & David Circa, Seychelles, VANELi, and Via Spiga. 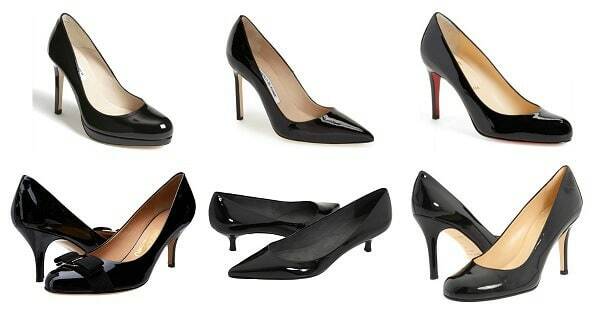 We’ve also named names for some of our least comfortable heels (brands and styles). If you’re looking to upgrade your shoe collection in general, you may want to check out our discussion on the different tiers and levels that people consider for shoes. Special Sizes: Wide heels can be found; we’ve also talked about general shopping tips for problem feet. In our more recent Hunts, we also try to include picks for wide/narrow widths, extended sizes, and (for boot round-ups) wide and narrow calves. Inserts can make a big difference with heels! I’ve liked Insolia inserts (read my review here), as well as Dr. Scholl’s and Foot Petals. (Insolia inserts really make a difference — something about the slim pieces of plastic helps my flat feet feel more comfortable in heels.) 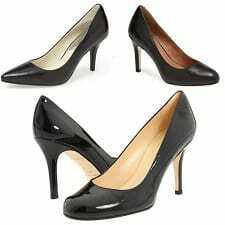 Note that some shoe maintenance (such as asking a cobbler to put rubber soles and rubber heel tips on your new shoes) can increase comfort as well as extend the life of your heels. I’ve also been a longtime fan of ball-of-the-feet inserts, like those by Dr. Scholl’s or Foot Petals. Finally, if you really can’t walk far in your heels, there are a number of foldable ballet slippers that you can stash in your purse, including Sidekicks, Footzyfolds, and Dr. Scholl’s Fast Flats . YogaToes can also be miracle workers after a long day in heels or on your feet. The book Your Feet Don’t Have to Hurt has a bunch of great foot exercises that help flex the muscles that might be sore after walking in heels (we rounded up some on our post for how to make your sore feet feel better), for example, drawing the alphabet with a pointed toe, or spending a few minutes, barefoot, trying to pick up a pencil with your toes. I would heartily recommend the book if only for that section! If you know the exact name of the brand or the style name you’re looking for, Amazon is hard to beat — they often have sale shoes in lucky sizes for steep discounts. Beyond that, 6pm.com (sister site to Zappos) has featured sales every day, and Nordstrom shoe sales are hard to beat. You can also occasionally find good deals at Bluefly, DSW (Designer Shoe Warehouse), or Last Call by Neiman Marcus. I highly recommend using Shop It To Me if you only want to know when specific brands hit a specific price range, ShopStyle alerts if you are stalking a particular brand, or shopping apps like Covvet if you’re stalking a particular shoe. (Read my other internet shopping tips.) For pricier shoes, resale sites like eBay or The Real Real can be a great way to get lightly used merchandise at a good price (but proceed carefully). * Please remember that peep-toe shoes are not appropriate for every office; the same goes for shoes with heels higher than 3.5″ and knee-high boots. We’ve even addressed whether Louboutins are appropriate for the office and talked about metallic shoes. Picture credit for FB/Twitter: Shutterstock / Martin Novak. Picture credit for Pin: Deposit Photos / studio-fi. I have a really hard time wearing heels all day due to a common condition called sesamoiditis. As a result, I often wear heels when needed but keep flats close by for commuting. However, I can wear any pair of Nine West’s 3′ heels without consequence all day. I’m not sure what it is about the fit, but I’ve never had any problem with them. One of my co-workers also swears by Nine West heels. Nine West heels are the best, I agree. Also, they last forever. Apparently they change the shape of the toe region every year on some of their classic heels, but keep the rest of the shoe the same — I know because I tried to buy an identical shoe to one I bought in 2006. 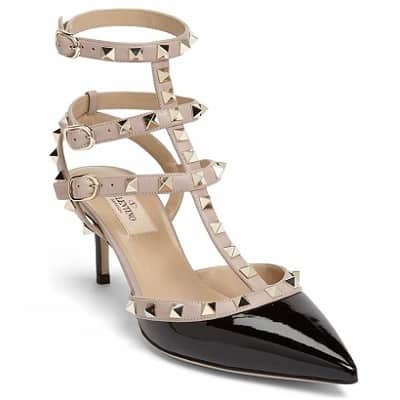 A majority of people on this blog seem to hate Nine West, but I can wear the Nuncio for hours on end, and I’ve had the same 3 pairs for 4 or more years. I have a closet full of Prada, Stuart Weitzman, and other expensive shoes, but my Nine West Nuncios are my favorite. I own four pairs. The finish is perhaps not as spectacular as on the Prada’s or Weitzman’s, but if you ruin a heel in a storm grate, you don’t burst into tears. The Nuncios make my legs look fabulous, and I can wear them all day with no issues. So glad to know this about nine west, where do I find them, I wear Ecco’s getting a little to expensive. Cole Haan Nike Air, hands-down, especially if you get the lower-heel version (I have the Air Mid Talia). Also, I don’t find my Louboutins to be particularly comfortable. They’re well-made, but a 4″ heel (100mm in Loub-speak) is a 4″ heel, and there isn’t much you can do about that. I bought my husband a pair of Cole Haan Nike Air loafers and now he can’t stop talking about them, which is another bonus: if you can convince your husband to spend the extra money on comfy shoes, he might be more forgiving about your shoe budget. Cole Haan Nike Air – Air Miranda — These will forever and always be my most favorite shoes. At $200 they aren’t the kind of shoes you buy every6 months but you won’t need to. They last forever and if you build a good rapore with your Cole Haan store, they will polish them for free and give all kinds of free comfy inserts. Not to mention, Cole Haan shoes go on sale all the time. I’m constantly finding great deals. Best shoes, hand down. I wear heels everyday to work because I’m short and work with all men. I need to have a little more authority. The same height heel (for example a four inch heel), will feel very different on different size feet. If a shoe has a four inch heel – and you have a short foot, such as size 6, your shoe’s ramp will be at about a 22 degrees angle to the ground and your ankle will be in much more pain than a woman with a size 9 shoe where the same four inch heel will only give her an 18 degree ramp angle to the ground. It’s a matter of the geometry of the triangle. The long side of the triangle which is the ramp, is in relation to the other two sides which are the heel height and the distance from the heel to the middle of the ball of the foot. The most comfortable way to wear quite high heels such as four inches, is to wear platforms. A four inch heel is then ‘cut down to size’ to be a mid heel of three inches. I have shoes from Audley, Gentle Souls, Hispanitas, Chie Mihara, Faryl Robin, Butter and Cydwoq (their shoes are pretty funky) that I consider quite comfortable. I have found Clarks to always make excellent comfortable shoes in my student price range. And the bonus is, for the last couple seasons the styles have been getting less and less clunky, so I heartily second that option. I don’t see Miz Mooz on here, and those I have always found comfortable. Not usually in stores, though, have to get them online, and the styles tend to fall in the funky Fluevog category. For cheaper shoes, I love Tahari – so comfortable and you can get them at DSW. Cole Haan Air are hit or miss for me. I’ve bought 2 pairs that were seriously uncomfortable. I agree–I find that the Air part reduces toe room and makes them squished and blister prone. Cole Haan Nike Air usually work for me, but I recently bought a pair of heels by Butter on sale and, despite the 3″ heel on this particular pair, they are truly comfortable! I typically bring a pair of flats to switch into for any walking further than 3 blocks – at first, I did this for comfort, but now that I have found some more comfortable heels, I do it to save the heels from the uneven streets in San Francisco. I’ve had the best luck with Calvin Klein and Enzo Angiolini for classic heels (which I can usually find for under $100). For fun colors or details, I like Nina’s lower-heeled options (up to 2.5″)…a little on the fancy/dressy side, but they add some nice pizzazz to a regular biz cas outfit. And of course any heel is more comfortable with a Dr. Scholl’s For High Heels insert thrown in (helloooo gel arch support). Cole Haan Nike Air – anything for me – the mid talia ones are my go to shoes for giving 4 hour lectures to graduate students. I agree with YEAH Franco Sarto! I have a pair of sling back platform wedges and even with a medium high heel they feel very comfortable to walk in. Part of their appeal for me is that the bottoms are very light weight so they stay on the foot very well. When I put my contoured foam high heel inserts into them they wear like flats for either all day at the office or for a kilometer walk to the corner store. The wedge high heel sling back style with peep toes looks great with both dresses and pants, or jeans. Love them! Unfortunately, they only appear to make sandals/open toe shoes. I have the “Benny” pair from this season, as well as a pair from an earlier season. They have extra padding in the footbed. In summer, I wear these shoes to work every day. They’re awesome. I just wish they made shoes for all seasons. Bunkster, I love the pairs of Athena Alexander sandals I have! Spent about 5 hours walking the San Antonio Riverwalk in a higher-heeled sandal, and my feet never flinched. 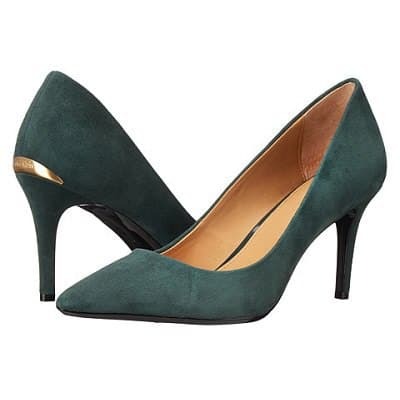 I really like Kate Spade pumps – great colors and styles – and very comfortable. For what it is worth, I have a large (10) wide-ish foot. FYI, Taryn Rose no longer owns the shoe company by her name, but the company still makes comfortable shoes. DSW sometimes has a few styles in stock. Taryn Rose (the person) has a new budget line sold on the Home Shopping Network (High Heel Power) and is reported to be starting a high end line with Neimans (Haute Footure). No idea if they are comfortable, but I would guess yes, given her background. I like the Cole Haan with the Nike Air, but right now I am absolutely loving Kenneth Cole New York with the 925 Technology. I bought two pair for $40 each (75% off!!) in their Las Vegas store last year and they are fabu. I feel like I am walking in tennis shoes and they are stylish and well-made. I have to stop myself from wearing them everyday. Highly recommended. Without a doubt, Cole Haan Nike Air. I have a wide range of shoes in my collection – 3-inch pumps, 4-inch pumps, boots, work-appropriate sandals, and casual sandals. I can’t complain about any of them. I have bought no less than 3 pairs of the Nine West Barbe pump. They’re affordable, comfortable, and come in a variety of colors and finishes. I adore them. 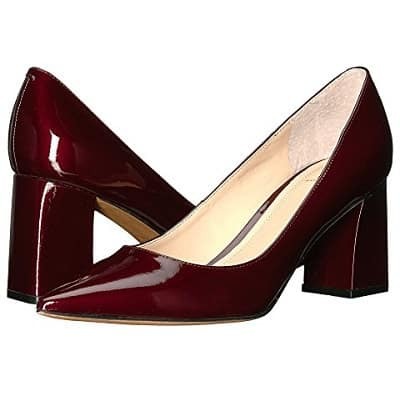 I’ve bought no fewer than 5 pairs of Calvin Klein pumps – very comfortable, and classic. I find Calvin Klein shoes to run a bit narrow–just a PSA for those out there who run into this problem. I second Calvin Klein Diema for a 1.5 in heel or Dolly for I think a 3 in heel. I agree they do run narrow but they’re great for narrow footed people like me since they don’t slide out as easily! I have been hunting for comfortable heels for a lifetime (it seems). My hands down favorite are a pair of Facconable peeptoe sling backs that are 3 inch high. They are so comfortable despite the height. I have tried every brand named above in varying heights and none are as comfortable as the Facconable. My feet are on the wide side (but not enough to warrant “wide” shoes) and I have a narrow heel. I used to think that it was the narrowness of the shoe that was making them uncomfortable, but after trying on pairs and pairs of shoes, it is not the width, but the depth. I think I need a deep toe box or the space between the bottom of the shoe and the vamp. I guess I have thick feet (sounds awful, no?). 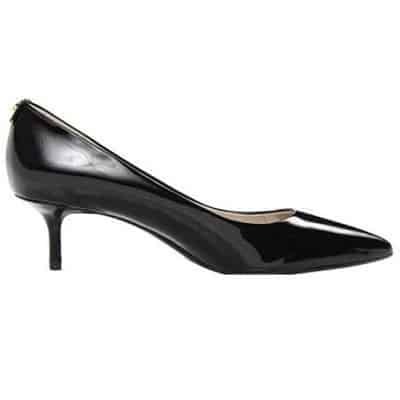 I have had some luck with the Calvin Klein pumps of late, but need the heel stickies to avoid shoe slippage. If anyone has any other recs for thick footed people, please let me know! Corso Como – extremely comfortable!! I second the Corso Como recommendation — priced right, extremely comfortable without being stodgy and fashionable enough to wear to after work events too! Thank you for the Corso Como rec, I’m desperate for comfy heels for an upcoming trade show x 4 8-hour days on my feet. Can’t wait to try. Brining my Rothy’s flats as a backup! Kenneth Cole Reaction, the 9 to 5 line are the best! I’m wearing a black pair right now and the cushioning is luxe on my feet despite the 4″ heel! Highly recommended at around $200/pair. after purchasing my first pair of cole haan nike pumps last spring, i will never again buy another heel; they are so incredibly comfy yet classic. i would recommend them to everyone. I second the Cole Haan Air. I find they run somewhat narrow, but the cushioning is great. A few friends of mine recommended the Alfani Step ‘n Flex line from Macy’s. I was skeptical, but they (Gracie and Denny pumps) were so comfortable from the first minute I tried them on. I have yet to put them through the test of walking marble floors at my new workplace or go through an entire day with them, but they come well recommended from many other friends. Best part, they’re one of Macy’s “everyday values” at $59.98. As I mentioned in the other thread, I have found Farylrobin heels quite comfortable. They don’t have a ton of cushioning, but they are well made and the heels are usually sturdy. They are of a style – rather than classic stilettos – with a chunkier heel most often, but I could walk blocks in them. A bonus is that the wider heels won’t get stuck in sidewalk cracks and the like. I couldn’t agree more. My go-to black heels are Naturalizer, and I have a couple of cute pairs. They’re all VERY comfortable. I’m a Naturalizer fan, too. They are quite comfortable and very reasonably priced, especially if you wait for sales and promos. Though, I can’t wear even their heels anymore (nothing over one inch) due to arthritis in one of my feet. 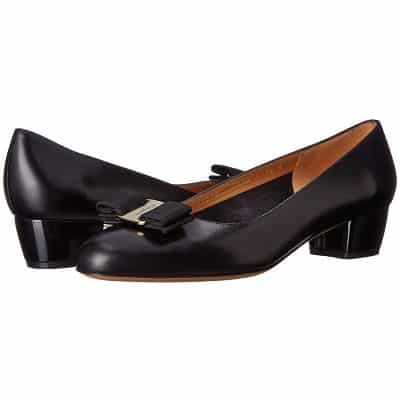 I’m a Naturalizer fan, too, but missed the one’s made in the 80’s/90’s that were lined in nylon tricot, and had the stretchiest leather, and felt so soft to wear all day long! Cole Haan Nike Air for the most part have good arch support. I stick with 2-2.5 inch heels. Sofft work great because they have extra padding under the ancle. Second – Love the perfect pumps. Have owned 4 pairs of them, bought over several years. Comfortable and durable. I have been in search of the perfect pair of pumps forever. I want to buy something not made in China, that has a 2-3 inches heel, no chunky heel or super skinny heel, no toe cleavage, somewhat wider shoes than a size medium, but wide. Is my list too long? I must have weird feet. I’m also a Corso Como fan. See here: http://corsocomoshoes.com/shop. I believe they’re made in Brazil. They don’t always have an appropriate pump every season, but I check back often. When available in other brands I usually opt for wide sizes, but medium width works for me in these shoes. I like corso comos, but the last pair of flats I bought were way too tight across the ball of the foot. I don’t wear wide sizes, either. Maybe it was just an off pair. Chie Miharas are always comfortable, but I can’t speak to whether they have wide sizes. I think they’re spanish? They are a little funky, not for everyone, but the heel is never skinny or chunky. Oh, I forgot to state, these pumps must be comfortable and do not make too much noise while walking on tile floors. No one has mentioned Fitzwell; is that not a common comfort brand? I bought a pair of 2.5″ Fitzwell Player pumps a while back. The brand has a range of styles, from pointy heel/stiletto to chunky/clunky, but the prices are great. My pumps are extremely comfortable and very classic, bordering on boring, which is great for upcoming interviews. I’d like to get more pairs of pumps from them (higher heel/pointier toe), but it would be nice to get confirmation that others find them comfortable at the 3″+ heights. Seychelles have not been mentioned yet. They are the most comfortable heels I own (and I own a lot ;p). They are well-padded, stylish, have rubber soles so I don’t slip on polished floors and the prices are very reasonable. I second Seychelles – comfy and often cute. I third this. In fact, I’m wearing a pair of Seychelles right now! I stumbled upon the Nurture brand at a Dillard’s about a year ago. I loved the padding in the shoes so much that I walked away with 4 pairs. They are cute, and so comfy! I have even run in my heels! There’s so much padding in the sole that it’s able to adjust to the shape of your foot. They are also reasonably priced. These are my go-to shoes for when I need a basic, every-day shoe. I highly recommend these! I have been really happy with a couple of pairs of Corso Como shoes. They have a really nice leather padded footbed with a lot more padding than most shoes. You by Crocs are amazing! The look absolutely nothing like Crocs, but carry the Crocs comfort. They tend to run about $100 for heels and about $200 for knee-high heeled boots. I’m happy to have found them and readily recommend them. I just wish I’d bought them in red while they were still available. The patent pewter is cute but too close to black. They do give a little toe cleavage but they are so cute and comfortable I don’t care. They are also the first pair of pumps I have been able to comfortably wear both with and without stockings. Ecco. The style can often lean toward the clunky, but occasionally you can spot a good work shoe. 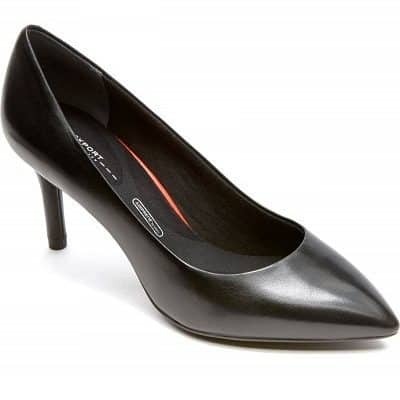 I bought a pair of Ecco pumps after recovering from a pretty severe ankle break – for a long time they were the only non-flat shoe I could wear. Not only comfy all day long, but even after wearing them almost daily that year, they still look great! Second the Ecco shout-out. I heart the Ecco Junction. Incredibly comfortable and sleek, and not at all chunky-heeled. This is such a great list. Stewart Weitzman and Cole Haan are my general go-to brands, but I’ve also bought some pretty nice shoes from Ara, David Tate, and Easy Spirit (they do actually make a few stylish pumps). ROCKPORT PILOT PUMPS. Enough said. They are AMAZING and at least half the price of Cole Haans. Only have the one pair, but I’ve found Paul Green to be exceedingly well-made. Comfortable for their height and style, and I’m super picky. If price is no object, I recommend Thierry Rabotin ($400 +). Beautifeel are wonderful, but a bit pricey ($200+). Munro American makes very comfy shoes you can buy for less than $200, but they are generally best with pants. There are so many more comfort shoe brands today than there ever used to be. It’s wonderful! « Sales and Big Shopping Roundup Emails!